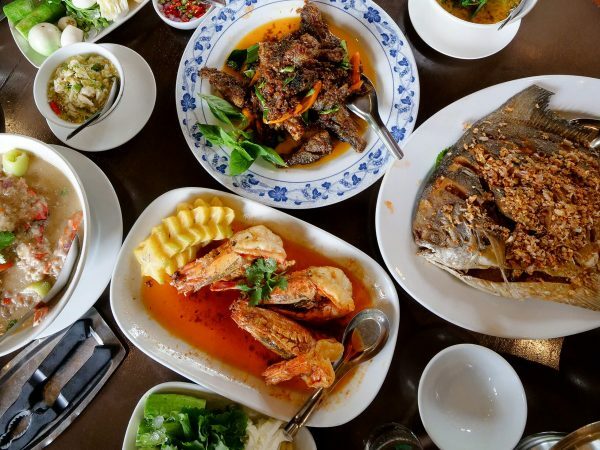 One of the ultimate places to find the best food in Bangkok is tucked within old areas of town like Banglamphu and Phra Nakhon. Located right along Thanon Dinso (sometimes spelled Dinsaw or Dinsor), a street in Bangkok right off Democracy Monument that’s home to a collection of delicious heritage restaurants, is Mit Ko Yuan (ร้านมิตรโกหย่วน). I had been meaning to eat at Mit Ko Yuan (ร้านมิตรโกหย่วน) for some time now, and I finally had a chance to go there. The food, which I’ll get more into below, did not let me down, and the tom yum goong was one of the best I’ve had in Bangkok. Mit Ko Yuan (ร้านมิตรโกหย่วน) is a small restaurant in the old part of Bangkok. The dining room is quite small and shophouse style, so it’s long and skinny with classic tables set up on both sides of the wall. 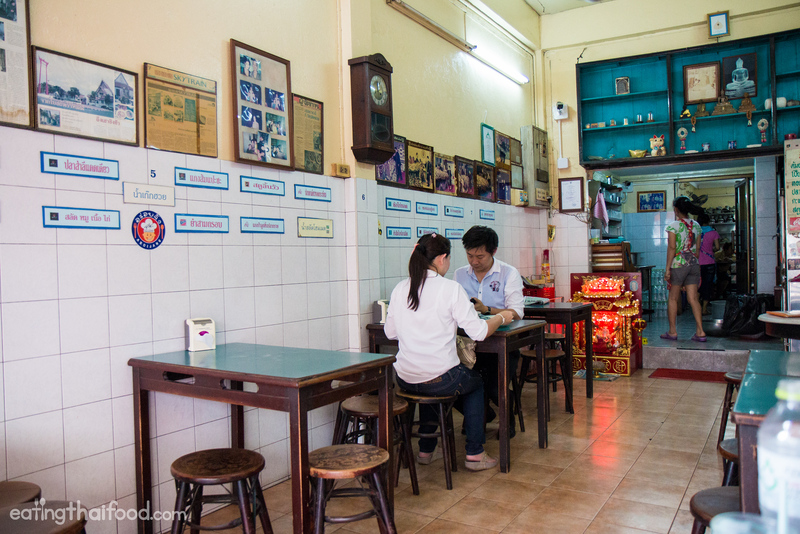 The turquoise blue color topped tables and wooden stools are some of my favorite old-school Thai dining accessories. Similar to using Chinese metal spoons to eat, when you see the turquoise blue tops on wooden tables in Thailand at a restaurant, you know it’s time for some throwback food. 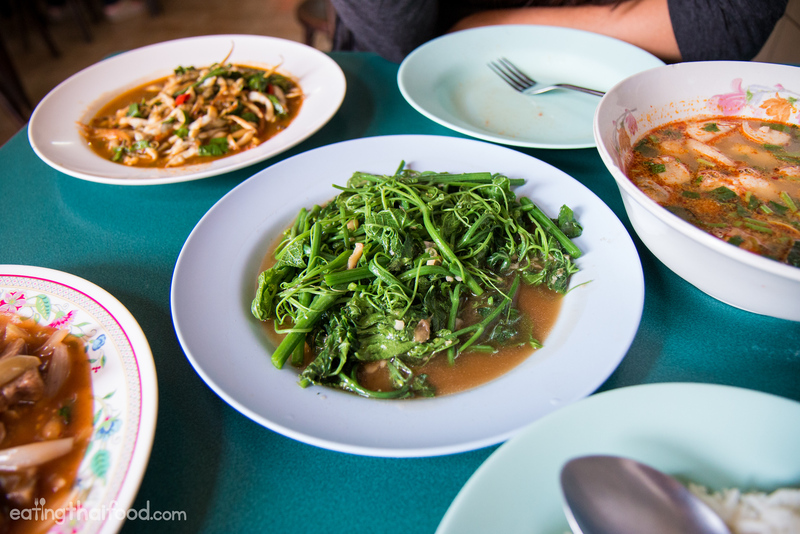 Mit Ko Yuan (ร้านมิตรโกหย่วน) serves a menu of mostly central Thai dishes. However just like at Yong Lee on Sukhumvit 39, there are also some Western Thai style dishes available on their menu. 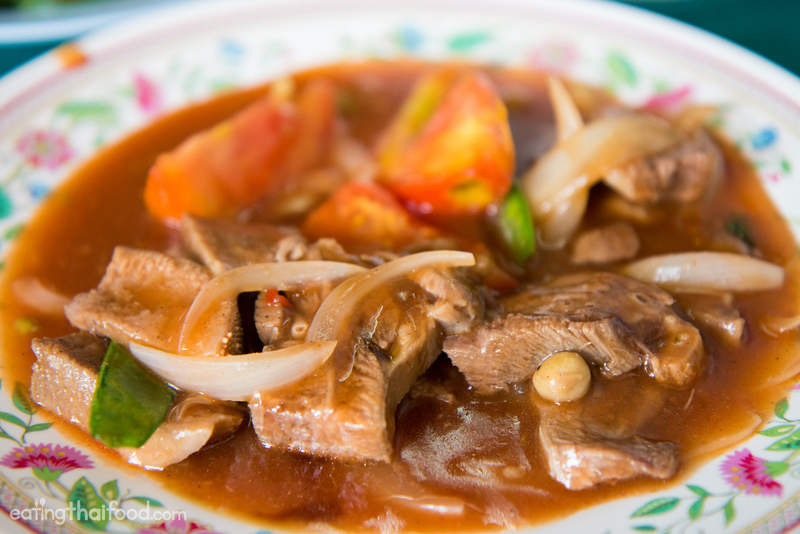 According to Chef McDang, western Thai dishes like beef stew came about during the King Rama IV period in the mid-1800’s when Westerners were invited to the Royal Courts of Thailand and Thai chefs started adapting Thai dishes to European flavors. So when you see some Western Thai dishes on a local Thai menu (not the modern western dishes), you know the Thai restaurant has some serious roots. Let’s begin with the tom yum goong (ต้มยำกุ้ง), which is the dish I was most looking forward to eating at Mit Ko Yuan (ร้านมิตรโกหย่วน) – not only because it’s one of my favorite Thai dishes, but also because it’s one of the signature specialities at the restaurant. It didn’t come in a fire flaming pot and wasn’t fancy, but the tom yum goong (ต้มยำกุ้ง) was just served in a bowl and from the color and the look of the ingredients, I could already tell it was going to be good. The tom yum goong (ต้มยำกุ้ง) was a beautiful orange creamy color. 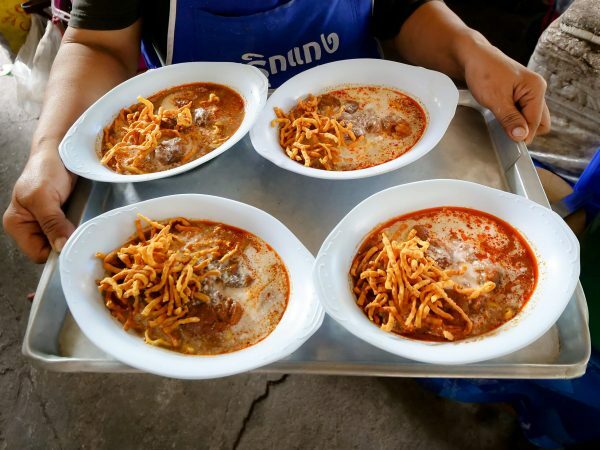 And one of the easiest things to recognize is that they didn’t add evaporated milk to make the tom yum goong (ต้มยำกุ้ง) creamy like at most Thai street food stalls, but instead all that creaminess and oil came from the head oil liver of the freshwater prawns. Within the tom yum goong (ต้มยำกุ้ง) there were mostly mushrooms, and then a few handfuls of barely cooked herbs that included mostly culantro and cilantro. What really stood out to me though was how perfectly cooked the shrimp were. While in many bowls of tom yum goong (ต้มยำกุ้ง) the shrimp can get rubbery and overcooked, the shrimp in this bowl remained extraordinarily juicy and tender. The tom yum goong (ต้มยำกุ้ง) broth was incredibly creamy and rich, sour, and balanced with a bit of sweetness. This was one of the best tom yum goong in Bangkok I’ve ever had. 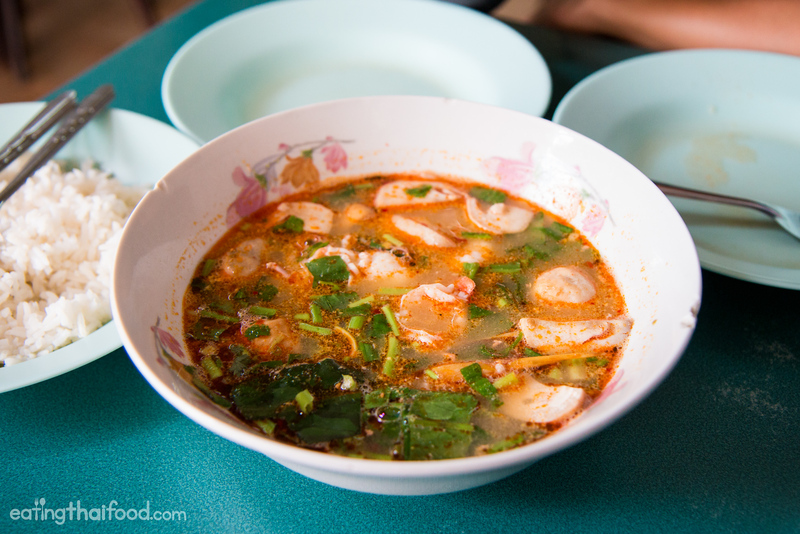 Maybe the only better bowl of tom yum goong I’ve had in Thailand was in Ayutthaya. I’m not saying it’s the best in Bangkok, but certainly one of the best I’ve had in Bangkok. When it comes to central Thai food, one of my favorite Thai dishes to order is pad cha (ผัดฉ่า), a type of meat stir fried with strips of fingerroot, chilies, sweet basil, and green peppercorns. 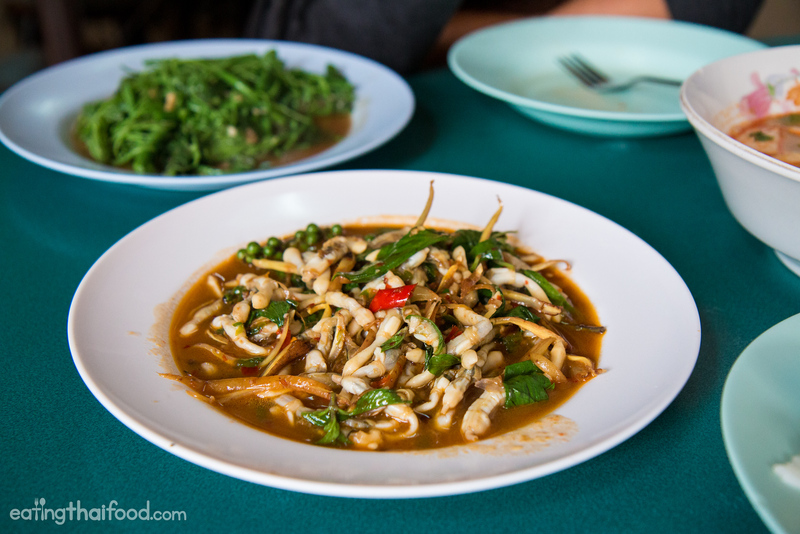 Pad cha (ผัดฉ่า) can be ordered with any choice of different meats, but it especially goes well with seafood or shellfish, as fingerroot in central Thailand is believed to really mask the seafoody flavor. 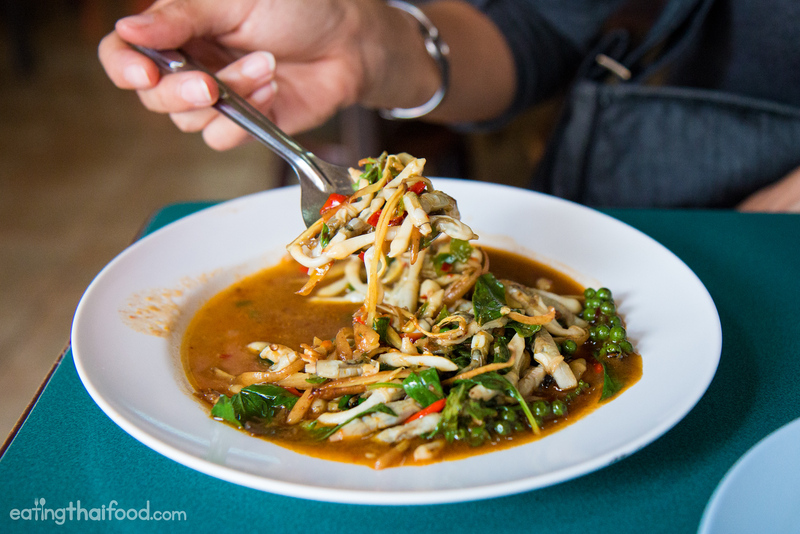 We ordered hoy lawd pad cha (หอยหลอดผัดฉ่า), a type of razor clam. It was everything I expected it to be and more. It was delicious. The little razor clams were very similar tasting to tentacles of squid, just slightly less chewy, and they had a wonderful clam flavor to them, but without having to worry about the shells. Fingerroot is such an excellent rhizome with a similar flavor to ginger, but to me it tastes even more earthy, and little more jungly. The sweet basil, the chilies, and the green peppercorns added more flavor, and along with rice, the hoy lawd pad cha (หอยหลอดผัดฉ่า) was excellent. Ok, moving onto the Western style Thai dish I was commenting on earlier in this post, I saw the sadoo (stew) neau (สตูลิ้นวัว), a beef stew on the menu, and had to go for it. The pieces of beef in the stew were extremely tender and most of the meat was quite lean. Along with beef, there were also chunks of just barely cooked tomatoes, onions, and a few snow peas. The thick brown gravy sauce was sort of a combination between a Western style brown meat based gravy and an Asian sweet and sour sauce. It had the hearty thickness of the stew, with a bit of a tangy sweet and sour flavor. It was a little sweet for me, but it was still really good with rice. Fak maew (ฟักแม้ว), which is also commonly known in Thai as yawd mara, which in English is chayote leaves, is one of my go-to stir fried vegetables. And as simple as it may look in the photos, the yawd fak maew pad nam man hoy (ยอดฟักแม้วผัดน้ำมันหอย) at Mit Ko Yuan (ร้านมิตรโกหย่วน) was one of the most amazing dishes we ate. My wife (who is Thai), could hardly believe how flavorful it was for just being a stir fried vegetable. Firstly, the vines were not overcooked, but remained nice and crisp. 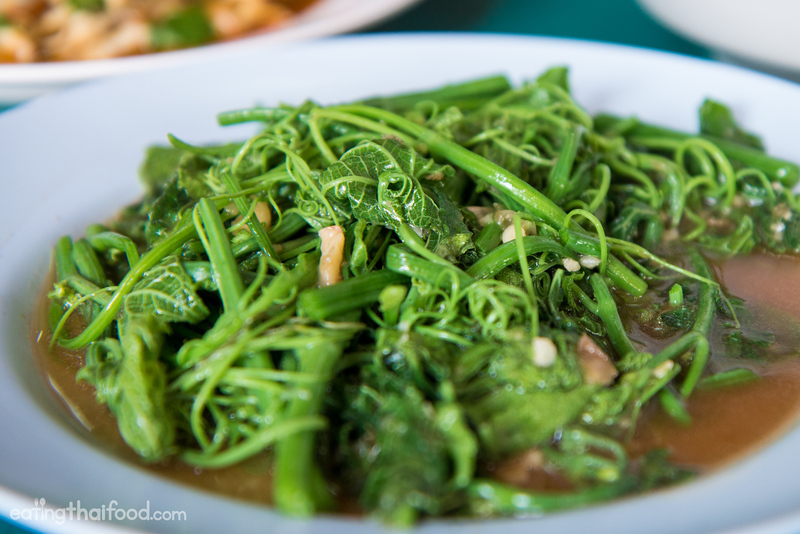 Secondly, sometimes when you order fak maew (ฟักแม้ว) they use the entire stalks so some of the leaves are very tough and chewy – but here they were very tender – so I think they used only the tips. Finally, the flavor was fantastic, not spicy with chilies, but just nice and garlicky, and a beautiful light oyster sauce flavor. We actually ate there right before they closed after lunch… and they close precisely on time! Mit Ko Yuan (ร้านมิตรโกหย่วน) is a classic Thai restaurant in Bangkok located on Thanon Dinso road, just down the street from Democracy Monument. After eating there, it’s a restaurant that definitely goes on my list of best places to eat in Bangkok. 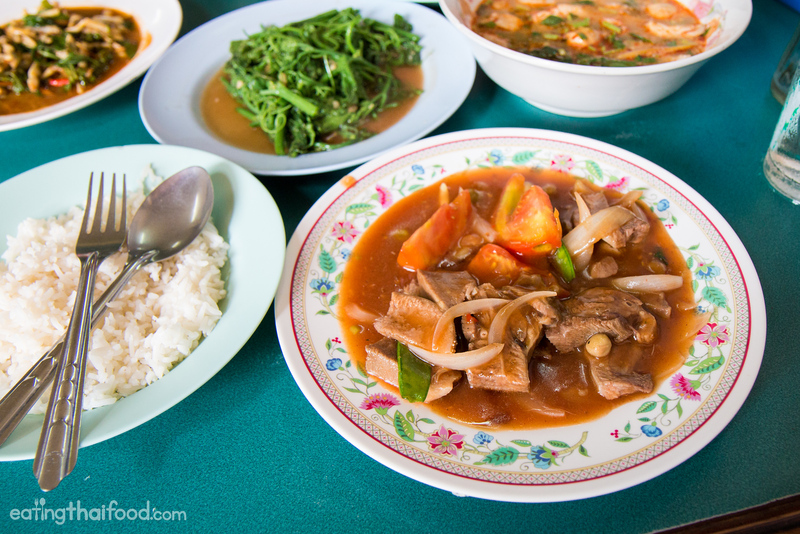 Most of the Thai dishes they serve are central Thai, with some real traditional and old-school dishes, and even Western Thai dishes available as well. One of the dishes I was most looking forward to trying at Mit Ko Yuan (ร้านมิตรโกหย่วน) was their tom yum goong (ต้มยำกุ้ง). The soup was rich and creamy, fragrant with lemongrass and herbs, and included perfectly cooked juicy prawns. Tom yum goong (ต้มยำกุ้ง) is one of my favorite Thai dishes, and this was one of the best tom yum goong in Bangkok I’ve had. 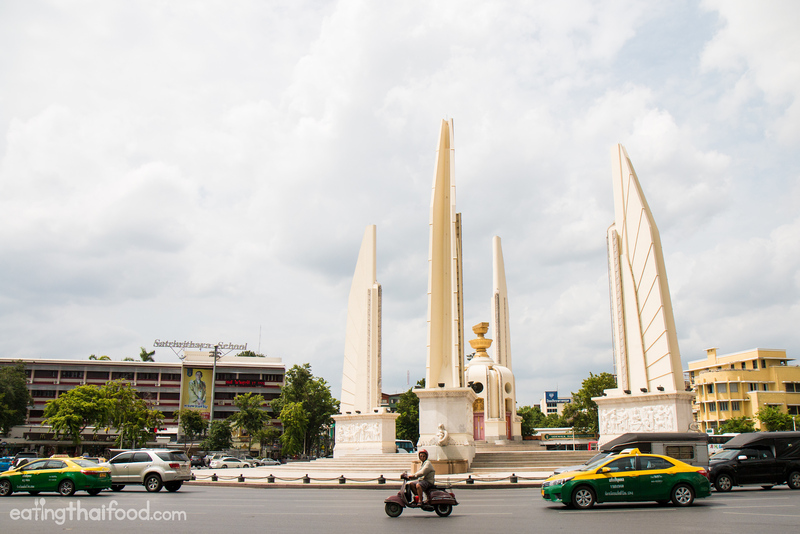 How to get there: Mit Ko Yuan (ร้านมิตรโกหย่วน) is located in Phra Nakhon, just down Thanon Dinso from Democracy Monument, and across the street from the Bangkok City Hall building and just a short walk from Wat Saket. เปิดบริการทุกวัน จันทร์ – ศุกร์ 11.00 – 14.00, 16.00 – 22.00 น., เสาร์ – อาทิตย์ 16.00 – 22.00 น. Had some family in town so tried out a few of Mark’s recs, most of which were excellent. But have to say I don’t understand the fuss about this place. Tom Yam was 6/10 at best, and the fact that it’s their speciality knocks it down to a 3/10 at best. Was flavourless falang food. Hi Tim, thank you very much, glad you’ll be coming to Bangkok in a few months. Enjoy the green curry! That takes me back 50 years. I fell in love with Thai food than. I married a Thai lady she is a wonderful wife and cook. We Grow our Thai vegetables and we have some great oriental markets. In Lincoln NE. THANKS FOR THE TRIP IN THE PAST. Visited that place in January 2017. Their Tom Yam Goong is not good anymore. Except prawns: those 3 prawns were tasty and big enough. But the soup has a pretty average taste, not spicy (even after I ordered Thai Spicy), bland taste – so pretty touristy treat. I normally have my Tom Yum at no-name place near Tha Din Daeng pier. It’s twice cheaper (45 with rice against 90) and has extremely more rich taste. Thanks for sharing Anton, sorry to hear the tom yum goong wasn’t as good this time. Mark is right with his ‘wasn’t as good this time’. I went there yesterday, and the tom yum was certainly not bland; deliciously sour, salty, a bit sweet and on the spicy side. I’ve been to this place numerous time over the last 5 years, and it was as good as before. Hello Mark, i’m a huge fan of your blog and your restaurant reviews. Every time when I’m in Bangkok or in other place where you’ve been before surely I do a city trip only for your places. Now l’m in this place Mit Yo Yuan :). Thanks again for your work!! Hey Robert, awesome to hear that, thank you for your support. Hope you had a great meal at Mit Ko Yuan! 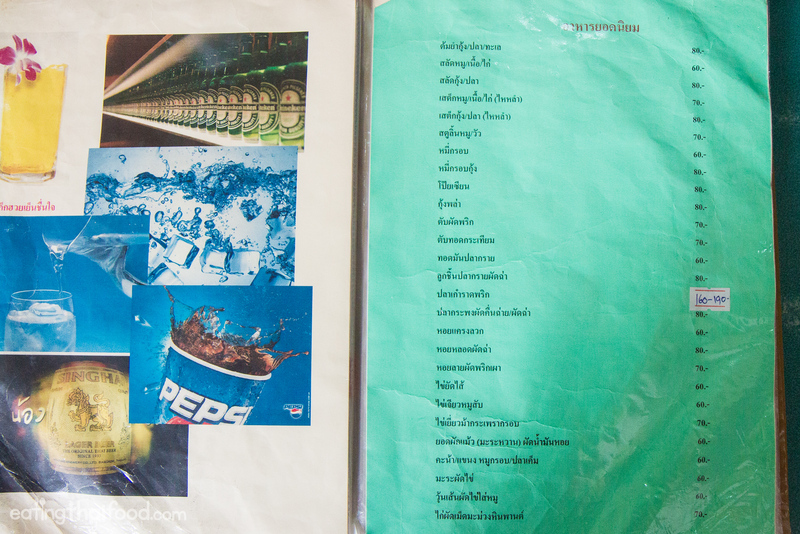 Omg..those foods are looking yummy… but the menu is written in Thai..hehehe..
Do the waiter understand English? My Thai languange is still on progress..hahaha.. Thanks Lyvee, glad this looks good to you. I’m not sure about English here, but they will definitely understand if you say “tom yum goon”! Thank you very much Ben. Have you been to this restaurant before too? Do you have any other good restaurant suggestions in this area? Thank you Ben, oh yes, that is a very famous place! I just Mark this down on my to eat list. Good to hear that Kitti, it’s so good! 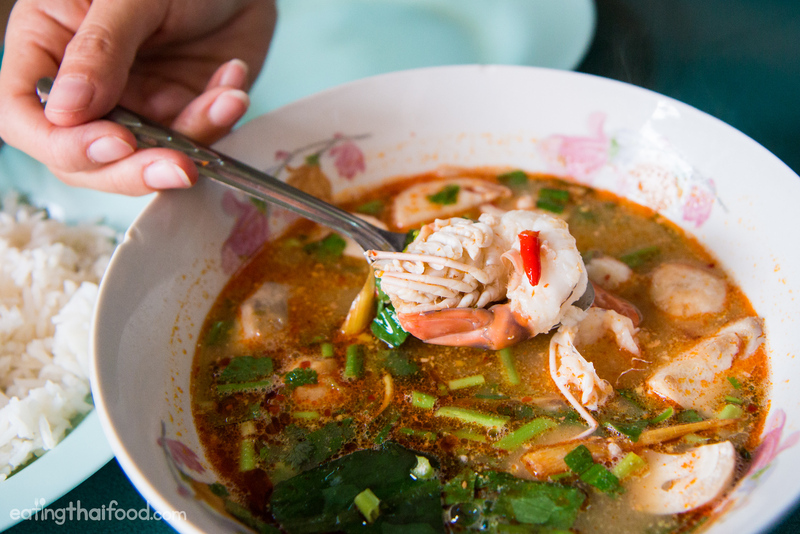 I’m going to visit Bangkok in the next 2 weeks, I really want to try this Tom Yum, can I take BTS or MRT to go there? I don’t want to take tuk2 since got scammed few years ago. Thank you. 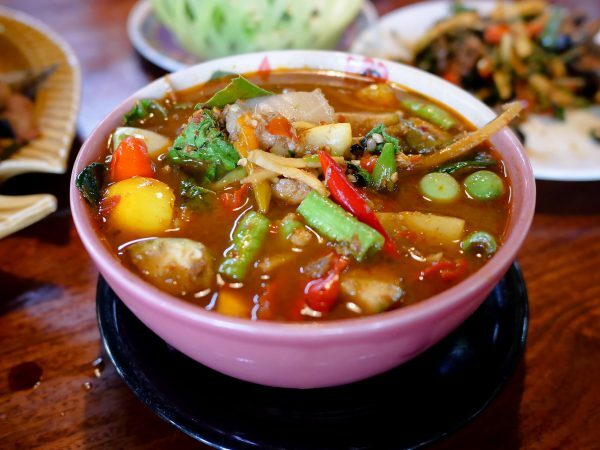 Hi Amelia, good to hear you’ll be coming to Bangkok again soon and want to try this tom yum. Unfortunately this restaurant isn’t close to any BTS or MRT station. However, you can get there by taking the Khlong Saen Saep river boat to Panfa Leelard station at the Golden Mount, and then this restaurant is just about a 10 minute walk from there, just walk down Dinso Road from Democracy Monument. Love the description and receipes of Thailand. So exotic.have family in Bangkok. Hi Nafisa, good to hear from you, thank you for reading. Good to hear you have family in Bangkok – do you come to visit sometimes?